Mad Science's "Nitro" Nancy Zade names Tatyanna Simeon the recycling champ as the program teaches students how to reduce, reuse and recycle at Rowayton Elementary School Thursday, November 15, 2018, in Norwalk, Conn. Students also learned about composting and saving water and how to become a more energy-efficient society. Schools in Connecticut are back in session! And with the returning of children to school there is one thing at the forefront of teachers and other educational professional’s minds—How to make learning fun? 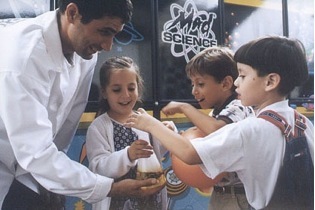 Here at Mad Science of Fairfield & New Haven Counties, making learning fun is our specialty! And working together with Connecticut schools over the last 15 years has been one of our favorite partnerships. 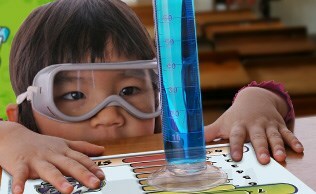 If you’re interested in finding out how to engage children in the scientific learning process, give us a call! Through our engaging and detailed school presentations, our Mad Scientists can introduce kids to new scientific concepts or reinforce the ones you are already studying. Taking multiple approaches in the delivery of education makes learning fun; and when kids have fun, they will remember and retain the facts and theories presented. Our after-school programs have been an extremely popular program since they were introduced in Fairfield County 14 years ago. They are flexible to your schedules and affordable as well. For after school program coordinators these after school activities are a value added class that keep children entertained and happy while learning in a fun manner. Maybe you’re a librarian or program coordinator for a community center looking for some excellent children’s programming? Give us a call, we’d be very happy to talk to you about our workshops and programs. Assessment Quiz to evaluate the students comprehension post workshop! 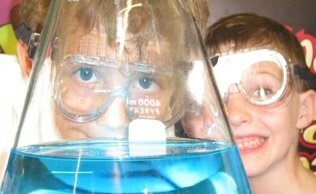 Contact us today and see how much fun Science can be!